Originally I’d planned to camp a night at Great Sand Dunes National Park before driving to Denver to spend Labor Day weekend with my family, but a quick look at the stormy forecast changed my mind. Camping in the rain isn’t my favorite, and without direct sunlight I doubted I’d get good photos of the dunes. So I headed to Denver a day early. I grew up in Kansas City and my parents continued to live there until just a few years ago, when they decided to join my two sisters and their families in the suburbs south of Denver. I miss having an excuse to visit my high school friends in Kansas City, but Denver’s location definitely has advantages. It was great to spend a few days with my family and take a break from the road. My niece Elizabeth masterminded our biggest adventure of the weekend, which started unusually early on Sunday morning. Elizabeth, my sister Ann, her husband Dan, and an exchange student named Sophie picked me up at 3:30am to drive to the top of Mount Evans for sunrise. 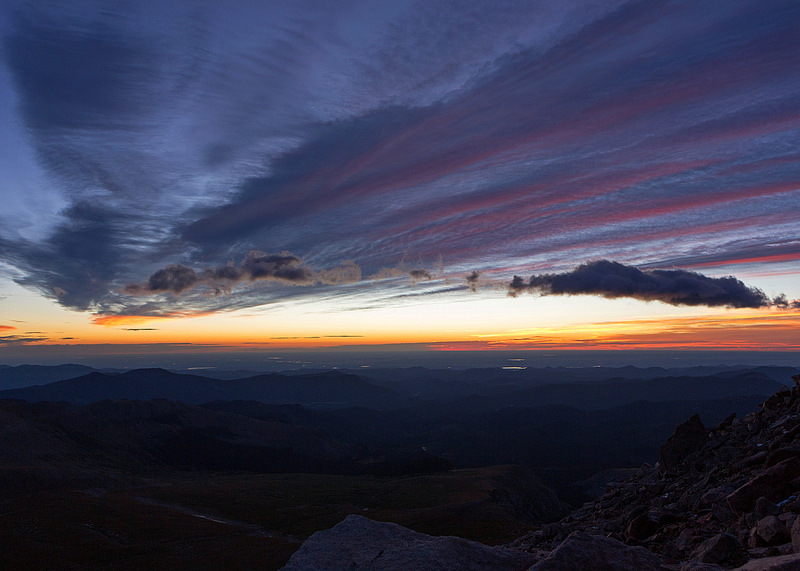 About 35 miles west of Denver, Mount Evans is a 14,271-foot-high peak with amazing views. It was still dark when we arrived and the wind was intense. Even just opening the car door was a struggle. The temperature wasn’t extreme – probably just below freezing – but the wind was truly brutal, and after short stretches outside I had to return the car to warm back up again. Regardless it turned out to be a beautiful morning, and watching the sun rise from that vantage point was a unique experience. My time in Denver flew by. Our whole family – except for my niece Kate, who’d just started school in Montana – gathered for dinner on Sunday night, and it was nice to see my sister Kathleen, her husband Antony, and their daughter Susan. We had one great meal after another, and my mom was thoughtful enough to make my favorite cookies. I was glad to have a chance to meet my sister Ann’s new dog Coco for the first time. 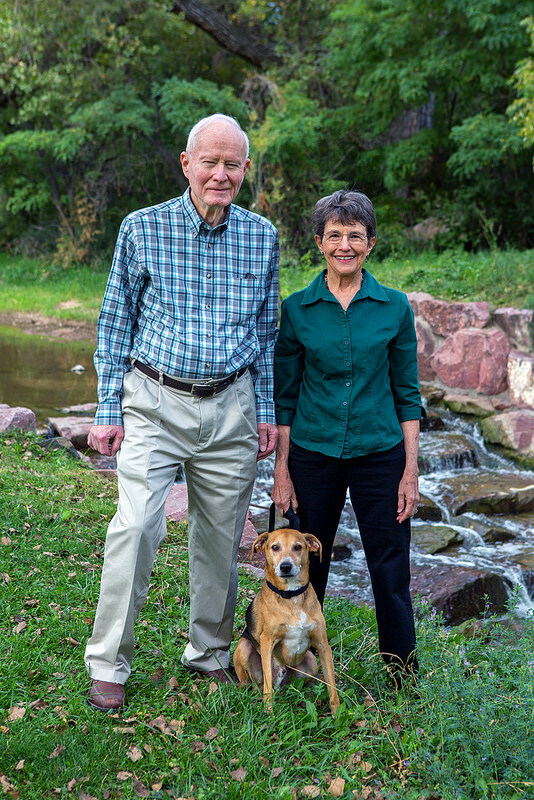 My parents asked me to take their photo for a holiday card, and I was happy to have an excuse to get a good shot of them. And I spent many hours working through the photos I’d taken over the past couple of weeks. Thanks again Mom, Dad, Ann, Dan, Elizabeth, Kathleen, Antony, and Susan for a great visit! You are very talented. Your images are breathtaking! I’m your dad’s trainer at South Suburban Parks and Rec and he mentioned your blog to me, so I wanted to check it out. Your folks are very cool and it’s been my pleasure working with your dad. Have fun reaching your goal of photographing all of our amazing national parks! Really nice of you to check out the blog Lori, and thanks for the great work you’re doing with my dad!